…compared to what man has made. Almost exactly twenty years ago I qualified as a vet, full of passion, full of love for animals and looking forward to a lifetime of helping alleviate suffering. Quite quickly I realised that much of my time in small animal practice was taken up with fixing man-made problems because of breed standards, totally unnatural body shapes and inherited disease. In 2004 I was interviewed for BBC’s Real Story about how unhealthy bulldogs are. 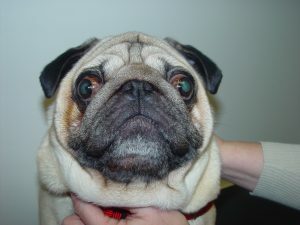 In 2007 I wrote a book about pedigree health problems, a major part of which was about brachycephalic (short-faced) breeds. In 2008 I was involved with the Panorama programme Pedigree Dogs Exposed which highlighted many of the problems I have long been unhappy about. And this week I lived with a French bulldog and realised that in those twenty years of campaigning I have achieved absolutely nothing. Many people have and will say I hate these dogs. I don’t. 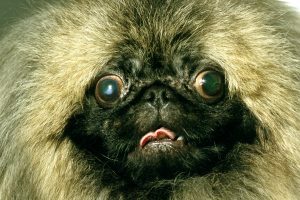 One of the things that makes brachys –pugs, pekes and bulldogs from every corner of the globe- so popular is their amazingly good temperament. I hate the shape of them, the dog inside them fighting to get out I love as much as I love all dogs. The last few years have seen a massive rise in the demand for brachys. Studies tell us that people like flat-faced dogs because they have many of the same attributes as babies; big, wide eyes and appealing expressions. I’d like to make it very clear indeed what having a flat face means to the dog you may well be thinking about buying. Shall we begin? Skin folds. Short-faced dogs have skin folds because when you breed for a short face all the soft tissue is still there so it has to wrinkle up to fit on the head. For years advertisers of moisturising creams have used wrinkly dogs to sell their products. People think wrinkled skin, or skin folds, are cute. If any of you know any obese friends, ask them if their skin folds are cute or even comfortable things. You will learn that nature doesn’t like skin folds. Skin is perfectly evolved to do a number of things. It is covered in bacteria that live in harmony with the body. It has hairs of varying density on various animals. It produces oils that help keep the skin supple. When you fold skin you lock out the air. You make a damp, oily place where all the good bacteria that like air die and all the bacteria that can survive in those conditions multiply to vast numbers. Because the skin is constantly moist it becomes inflamed and damaged and these bacteria invade and cause skin fold infections which are painful and will persist as long as the fold does. Chronic inflammation and infection in a show dog. 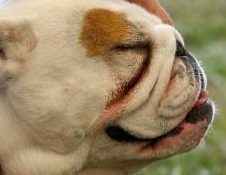 When you see white bulldogs with red-stained skin folds that’s not normal, that’s chronic pain and inflammation. And that’s on every wrinkly dog whatever the colour or how difficult it is to see. Big, wide eyes. Ah yes, those lovely wide, appealing baby eyes that sell so many of these puppies. Skulls and eyes are pretty incredible things. They have evolved over millions of years together. Not surprisingly natural skulls like to protect eyes because eyes are very precious things. Bulging eyes perilously close to popping out. Not many blind animals survive in nature. When you make a skull flat you make the eye sockets flat too. This means you get very cute, large eyes that protrude from the skull. 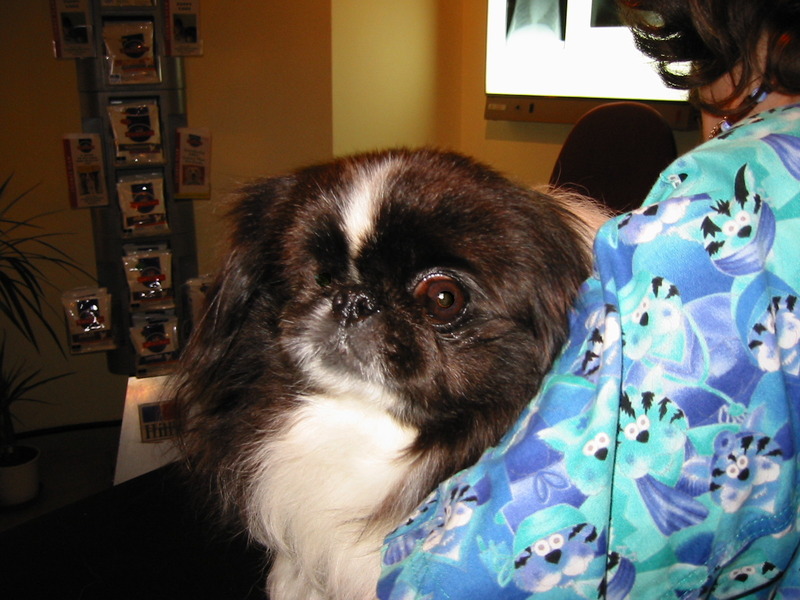 This means that sometimes, particularly in breeds like the Pekinese, when these dogs gets restrained, say for nail-clipping or anaesthesia, or even sometimes in severe cases when they yawn or get too excited their eyes can pop out. This is not a joke. Ask ten vets. At least one of them will know of a brachy whose eye has just fallen out of its own head. I recently went to a pet show and overheard a pug owner telling a child playing happily with the straw in the kids’ zone to stop having fun in case the pugs’ eyes got damaged. This issue isn’t normal for a dog, it’s a devastating, man-made problem. When you have bulging eyes next to those skin folds we mentioned you get eyes that are constantly rubbed by hairs. Anyone who’s had an eyelash stuck in their eye knows how excruciating it is. Imagine multiple hairs rubbing both eyes for the whole of your life. Not surprisingly this often leads to trauma, non-healing corneal ulcers and in many cases the loss of the eye. A lovely patient of mine who lost an eye from trauma. Chondrodystrophy. Queen Anne legs are features of carved wooden furniture and dogs with shortened legs. I know I’m banging on about evolution but it’s taken its time to get things right, like straight legs and joints and bones and cartilage that work, so I think it deserves some credit. When you make a dog have short legs, or a screw tail or a short face you select for chondrodystrophy. It’s a long word but you’ve most likely heard of it called dwarfism. If any of you know humans affected by dwarfism ask them if their joints work well and are comfortable. The screw tail of many bulldogs is also a sign of spinal disease. You have to mess up a base of a spine to get a tail that screws round like that. Well done. Inability to give birth. Big heads and narrow pelvises don’t make a great combination for natural birth. 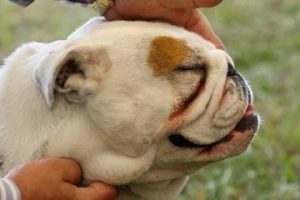 Without veterinary intervention bulldogs would die out in a couple of years without a doubt. If a breed can’t pass the most basic test of procreation and birth you need to say goodbye to it I’m afraid. Respiratory DISTRESS. I’ve highlighted the word distress because it’s important we are clear about the worst of what these dogs suffer, every single one of them to one degree or other. 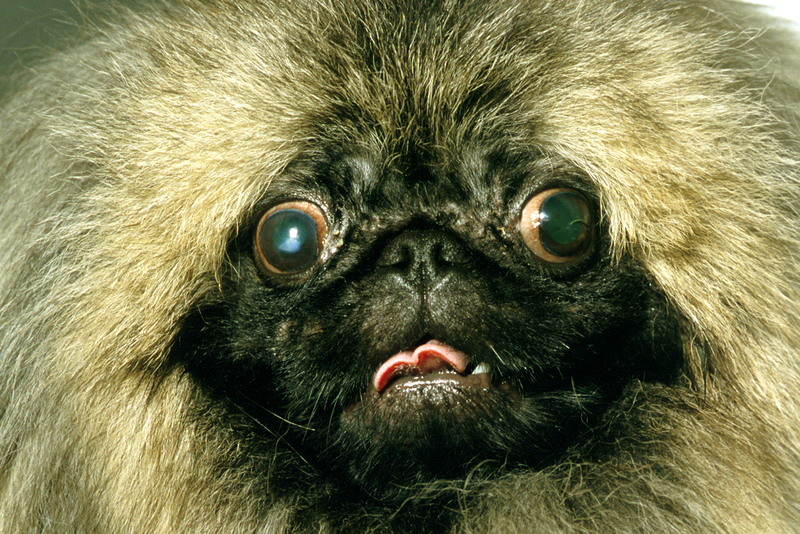 Brachys have a whole syndrome of defects that are part of their breed standard. It’s pointless the lovers and breeders of these dogs saying that it is not part of the breed standard because if you want a dog to have that face and that head they will have respiratory problems. Like with the skin folds on the face, when you shorten the face all the soft tissue in the mouth is also still there but it has nowhere to go. 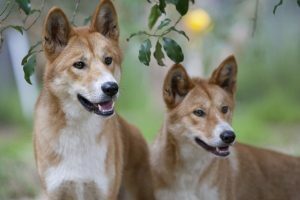 This means the dogs have long, floppy soft-palates that get sucked into their airways so their trachea is always a little bit (or a lot) obstructed. Narrow nostrils are just the tip of the iceberg. Because of their facial deformities they tend to have very small nostrils so even at rest with their mouth closed they can’t get much air in. Selecting for this shape has also produced a really narrow trachea like a straw. This means that even if some kindly vet manages to surgically open its nostrils and trim the excess off its soft palate the dog still won’t be able to run for any length of time. It certainly won’t be able to cool itself down by panting and air exchange when it’s hot, another one of evolutions clever tricks. When brachy lovers chuckle about that endearing snore or tell you that these dogs don’t need much exercise this is a ‘dog lover’ telling you that their dog is in constant respiratory distress and might actually really love to have loads of exercise but is liable to collapse from heat exhaustion because it is deformed. 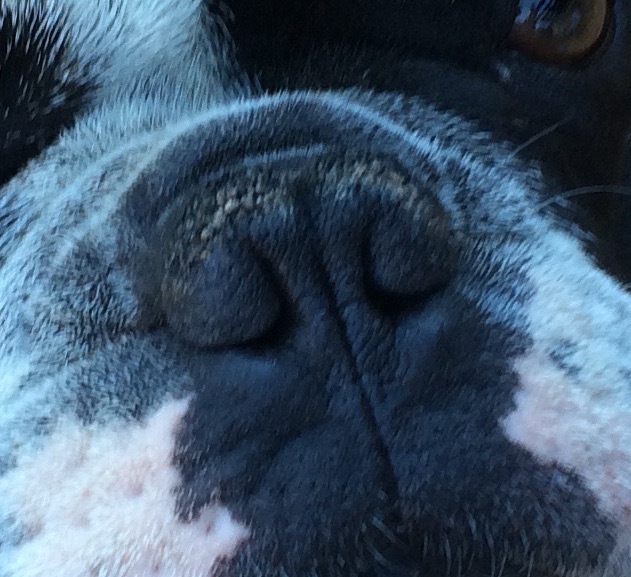 Brachycephaly isn’t a desirable shape, it is a combination of deformities. I can’t overstate this. They would not exist in nature, they suffer lifelong pain, discomfort and distress, they lose eyes, they die after anaesthetics because they have no airways as they recover, their teeth don’t work because they don’t fit in their mouths, they can’t sniff things properly, their undershot jaws make eating a daily challenge. Life is a constant struggle. If you are a vet or a vet nurse, sign the petition to get these dogs changed or banned. If you are an MP, campaign to ratify the European Convention or pass a British law to ban this conformation. 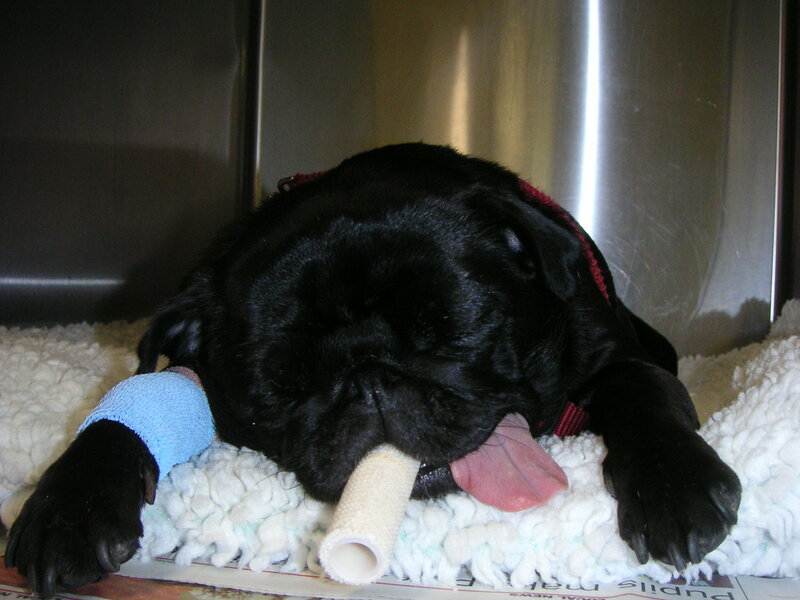 If you own a pug, peke or bulldog, look after it, lavish it with love and spend every penny you have alleviating its suffering. And when it dies NEVER buy another one. Vets are powerless to stop this suffering because people never ask us before they buy. All we can do is pick up the pieces and correct what we can when we can. We are SICK of it. If you can finally see those cute faces for the hideous, horrific deformities they are you will stop the demand for these dogs. They will eventually stop being bred and I might finally be happy and feel like I’ve done something worthwhile with my paltry veterinary career. 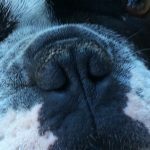 Share the hashtag “NiceDogShameAboutTheFace” and let’s see some solidarity to end this totally preventable suffering of thousands and thousands of dogs.